I like to personalize the gifts I give to people. I make these myself or if I am busy I have go-to artists to help. I use my own pictures and small items like charms that I find on my trips to make these gifts. Hint: It is smart to purchase these products for personal use from different artists throughout the year and see the products and get acquainted with the artists. These artists get to know my style when I have a special request of them. This post contains affiliate links. If you buy an item through one of my links, I will get a small commission, at no extra cost to you. Thank you for supporting this site. This is my list of items I like to make. These artists I use are on Etsy.com. I know I sometimes get overwhelmed with tedious searches, it is nice to share our favorite shops with each other. Let them know you found the information here! 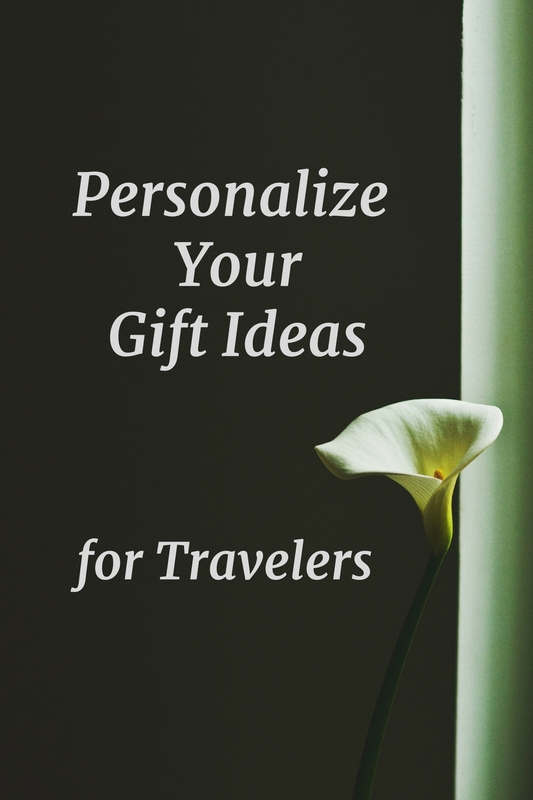 Fun colorful luggage tags, make them personal with icons and pictures. I found these made with colorful fabric. This is a good way to personalize your own luggage, plus it is fun to see the decoration hanging from your bags. The shop is Floridabaglady2 - ask about custom colors and size. Affordable, creative jewelry is a great accessory when traveling. Earrings and scarfs are my go to items to bring on my trips. We know we should keep our packing to a minimum – simple accessories like earrings and scarfs do not take up room – pack them in your shoes – and they change our appearance with excitement to the outfits we travel with. 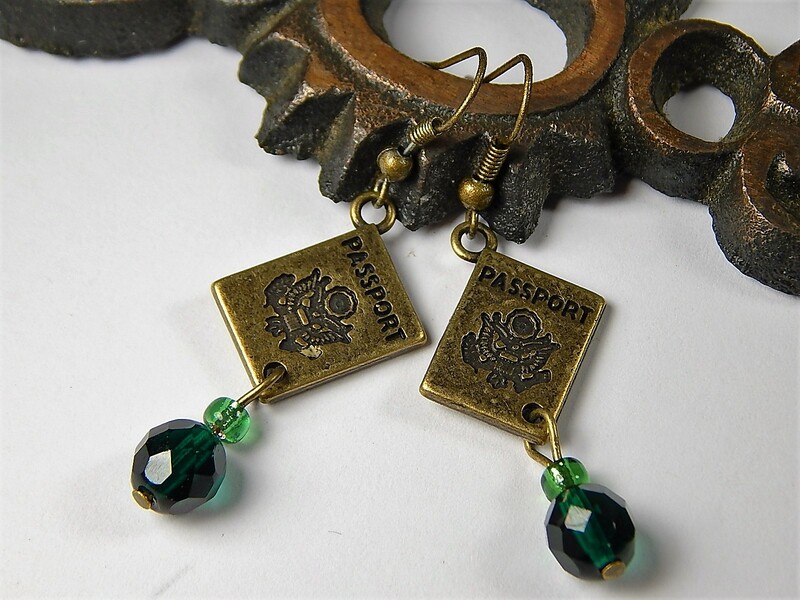 I wanted new earrings with passports charms and green beads – I emailed one artist I frequently use and this is the result. This shop is Murphys Beads and More. I found Pat Boyds Creations, an artist who makes items that are repurposed and recycled. I bought earrings made from recycled maps – these are cool and lightweight! These Vintage sun glasses decorated artistic pops of paint color on the front are unusual and one of my own favorites. I love to send and receive photo books and cards from people. This is a quick glimpse of telling our individual stories. Yes, we all share social media, these books are great to keep and add flavor to your coffee tables. Keep the cards in a basket to look through. There are many sources to use – my favorite is Shutterfly. This is my card from last year. Laptop Locks are fabulous gifts we all use and helps keep your laptop safe if you are in need to step away from your work for a few minutes after we drink all those beverages to stay hydrated. I like to use the locks with keys. I love my small black travel pouch that I even carry every day. The one I use is a “Royal Traveller by Samsonite Small Black Canvas 6 in Travel Pouch with Strap” which I carry at home. It is convenient when going to sports stadiums and concerts where you cannot take a larger bag. 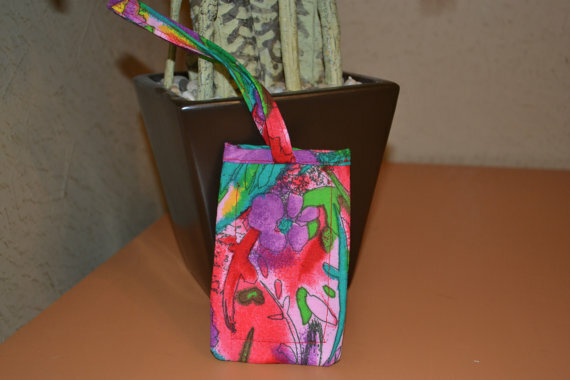 Hint: Look for pouches with zippers on all of the inside pockets and where you keep your paper money. Mine even has a clip on the bottom. These ideas may be used for all occasions. What gifts do you make? Do you find this article helpful? Please click to items in my sidebar and share. I spent just a short time in Frankfurt, at the very beginning of my trip. 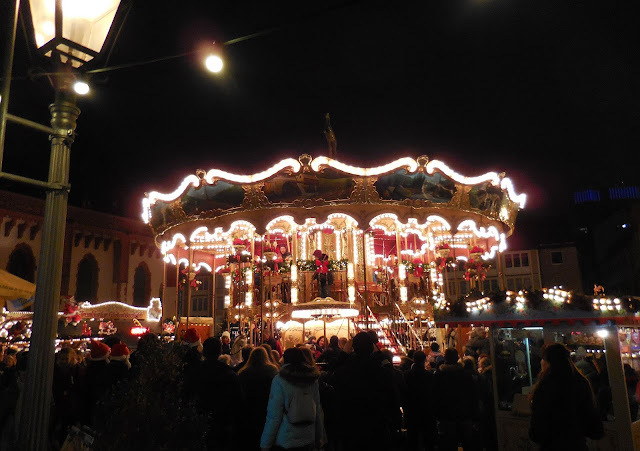 December travel in Germany is popular due to the festive Christmas markets. 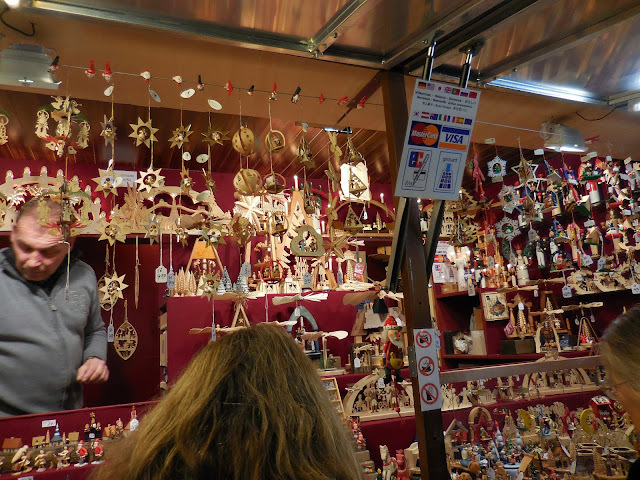 You will find the popular Weihnachtsmarkt in Frankfurt — one of the oldest in Germany. 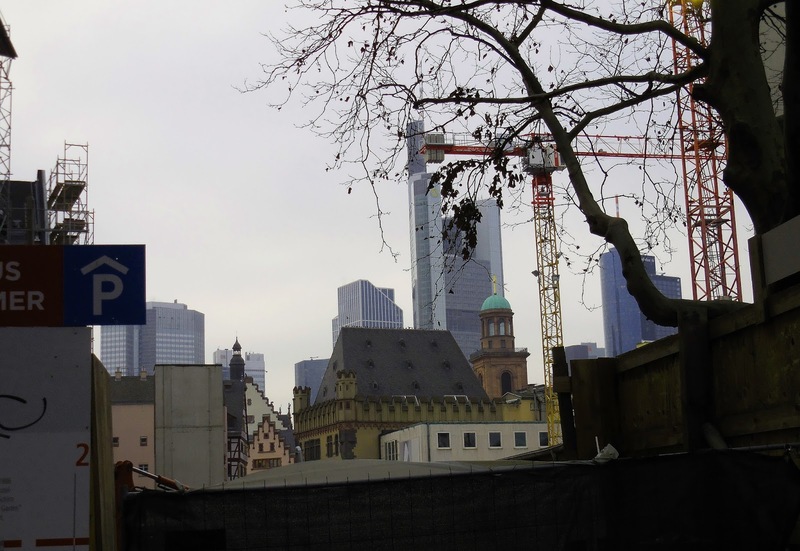 It started as a place where locals could purchase supplies for the winter, and was open only to people who lived in Frankfurt. The population in this modern city is about 650,000, slightly lower than the city of San Francisco, and is easy to navigate the streets. The market is located in the city center near Römerberg, St. Paul's Square, Mainkai (Main Quay), Hauptwache, and Friedrich-Stoltze Square. Special regional treats include Brenten, Bethmaennchen, and Quetschemaennchen — miniature candy figures and typical Frankfurt biscuits. Legend has it that suitors would send biscuits to the maidens they were fond of. If the maiden was interested, she would keep them; if not, she would return them. I guess I am interested in my suitors, as I always keep mine. Frankfurter sausage, of course, is very popular and can be found throughout the market. I love to taste each region's sausages. My insider secret: Two things to remember when traveling in December are the weather change and daylight hours. 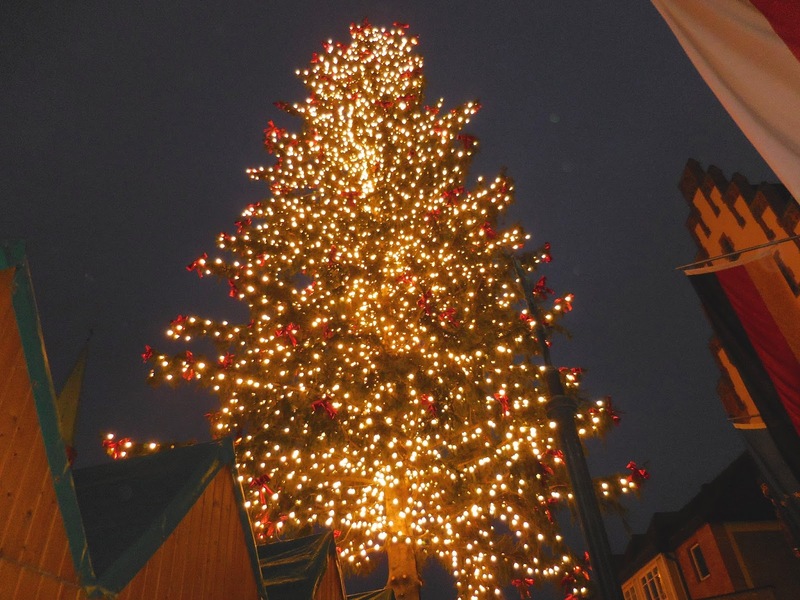 The days are short, so be sure to start early in the morning for sightseeing and enjoy the Weihnachtsmarkt in the evenings. I arranged my early days with cousins and friends for a small brunch. 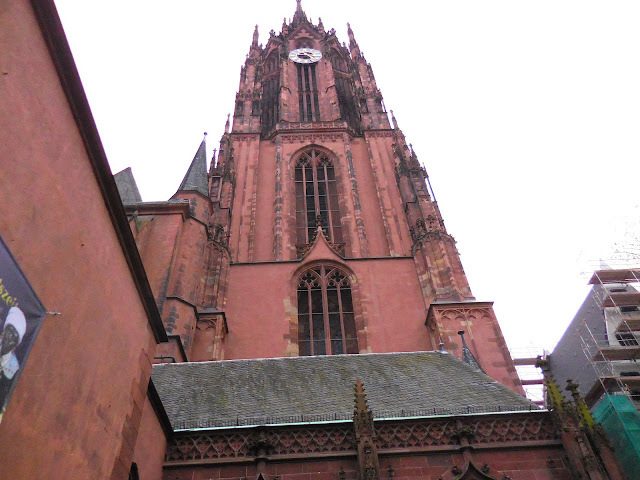 This is one of the best meals I had in Frankfurt. It was at the popular city center coffeehouse restaurant. 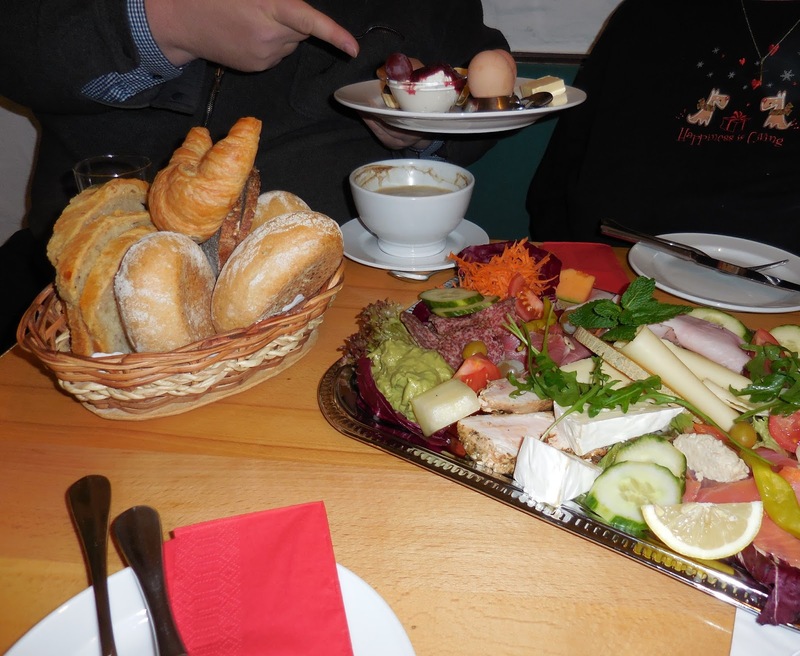 My group shared this large platter of meats, cheeses, and small bites like olives and fruit, complete with a basket of German rolls and breads to eat during our conversation. We were served champagne as well. Both the conversation and the delicious food were fantastic! It is no secret that I love breads — and bakeries, as you know from reading some of my stories. I like German brot, or breads, and this bread is different from other regions. My favorite type of bread is Brötchen, or bread rolls. I don’t like bread that falls apart or gets soggy when eating sandwiches. I read that German breads are heartier and more stable than breads from other regions. The reason for this might be the climate, which is not conducive to the wheat production in Germany. I do know that one slice of this good, hearty bread fills me up right up. People still buy bread products from bakeries in Germany, and there are no typical brands. Even though you may request a sandwich, people don’t make sandwiches like we do in the USA. 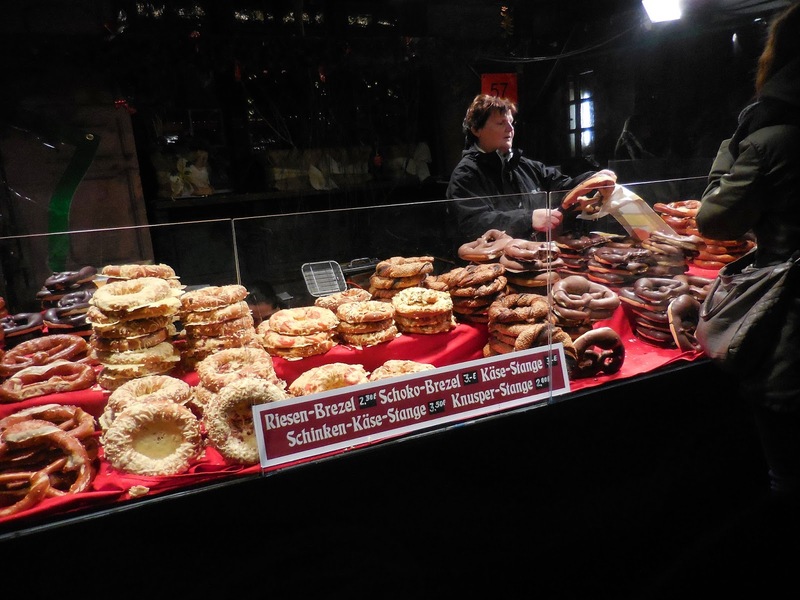 In Germany, the breads and rolls are typically eaten separately from other food items. And there are the most delicious cheeses, meats, eggs, and produce served on platters for lunch alongside German breads and rolls. 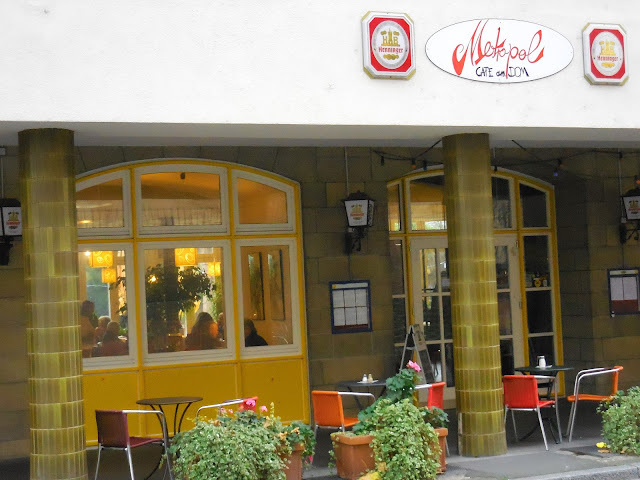 The Metropol Kaffeehaus am Dom is located across the street from the famous Cathedral of St. Bartholomew (Dom St. Bartholomaus), and not far away from the city center and the Weihnachtsmarkt. I enjoy combining holiday decorations and gifts from these markets with my own. What is your favorite Frankfurt hideaway? Tell us with your comments below. Let me help choose small culture trips this year? 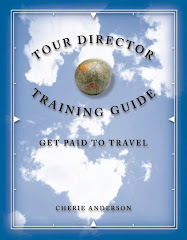 All images are property of and must be used only with the permission of Fun Tour Guru. What is your favorite Frankfurt hideaway?